- installed some low output alnico 3 humbuckers (i actually had gfs dynasonic clones in at first but decided against them, too middy and overwound), with 1 meg pots and 50s wiring. what you see on them is just fancy toaster covers bought as extra. 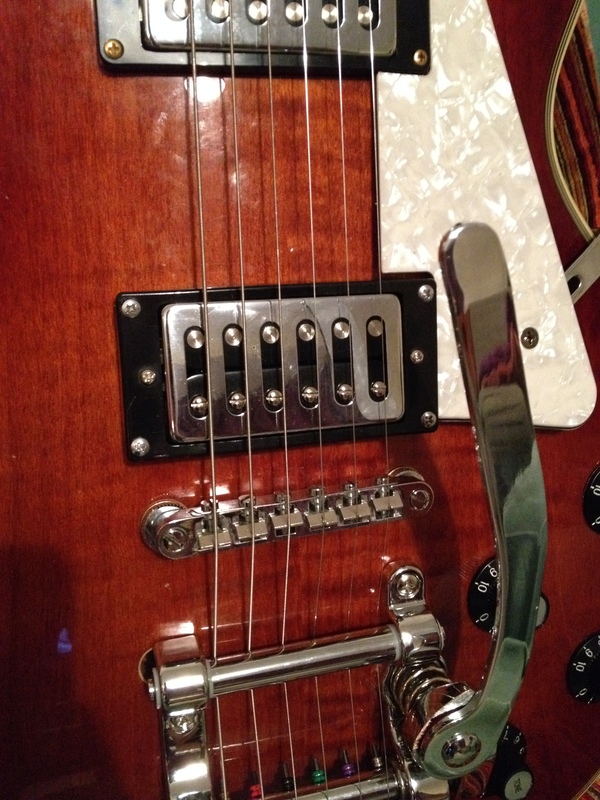 the guitar plays well but the bigsby isn't 100% yet, and the humbuckers need some fine tuning. i think the understated tobaccoburst, toaster pickups and witch hats give it a slight earthy and masculine quality, that is perhaps more "junkyard/pawnshop americana" than it is gretsch. i also paid for a nice fret levelling so the action is ridiculously low. on the whole i'm happy with it, but don't think humbuckers are for me. the quest may continue. possibly some rose humbucker sized jazzy pickups..
Really lovely upgrades George - how's the Bigsby clone? Thanks all. The bigsby is okay but it's not holding tune 100% after use. I think that might be because I've not used the stock spring and went for a spare higher tension one that came with the gfs xtrem, so will see if changing it will improve. By the by it's not as good as the gfs xtrem at the moment. That thing is set and forget right out the box. 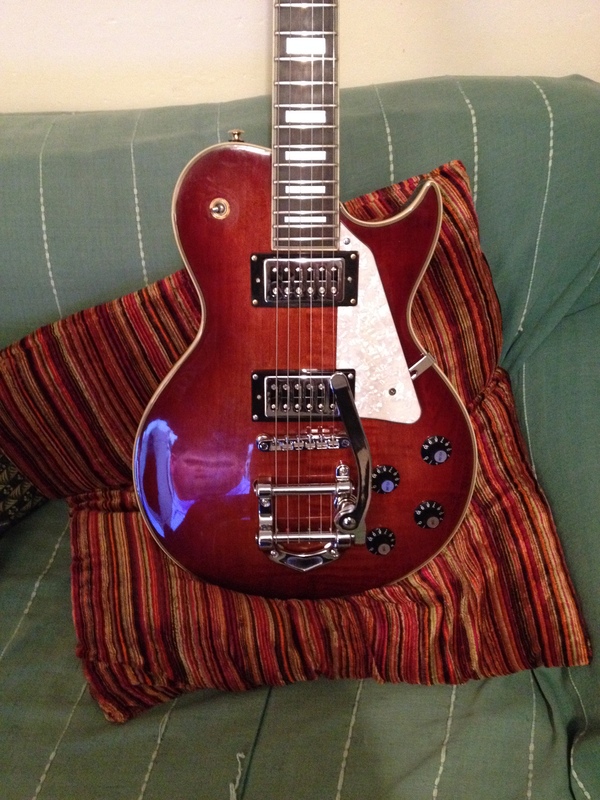 This clone however looks the business and utterly identical to a bigsby, and feels like one, so worth a little effort. So if looks weren't an issue would you suggest this or the equivalent GFS? I quite like the look of the GFS but largely the curvy Bigsby looks better. I'll let you know later today about stability after I've spent time with it. Having said that, on functionality alone the gfs has string through tailpiece, 2 different springs and full arm rotation as standard. The bigsby has the looks, and you can saw the nub off anyway. The spring feels very nice though actually, nicer than the gfs maybe. Close race but if this ones tuning holds up I'd take the bigsby but knowing that the peg string holders are a nuisance and there is only one spring. Nice work George... kind of reminds me of Johnny Marr's Gretsch super axe. You might want to dab some of the vaseline graphite mix on to the nut string slots too. make sure that the nut slots are not restrictive. 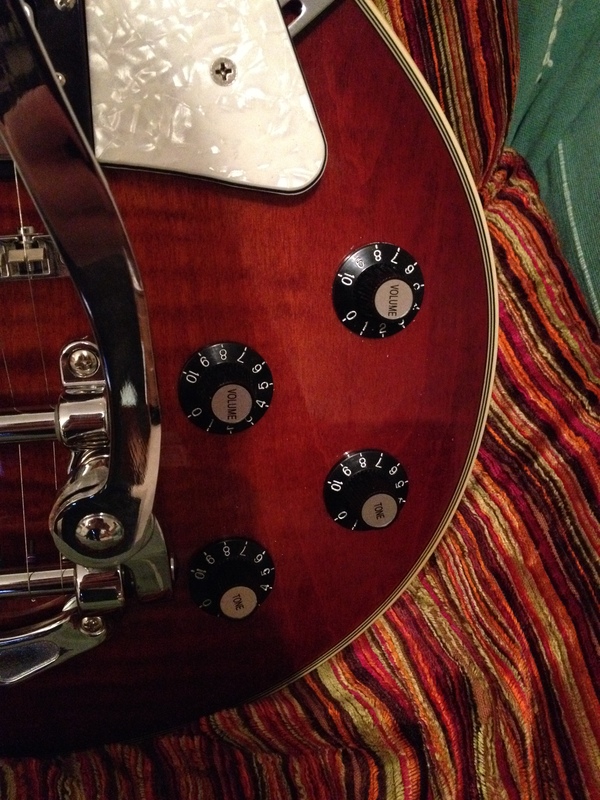 Of the guitars that I have had that had tuning stability problems, tight sticking nuts slots were the problem. thanks, i've already done the old graphite and vaseline trick, although not on the saddles. 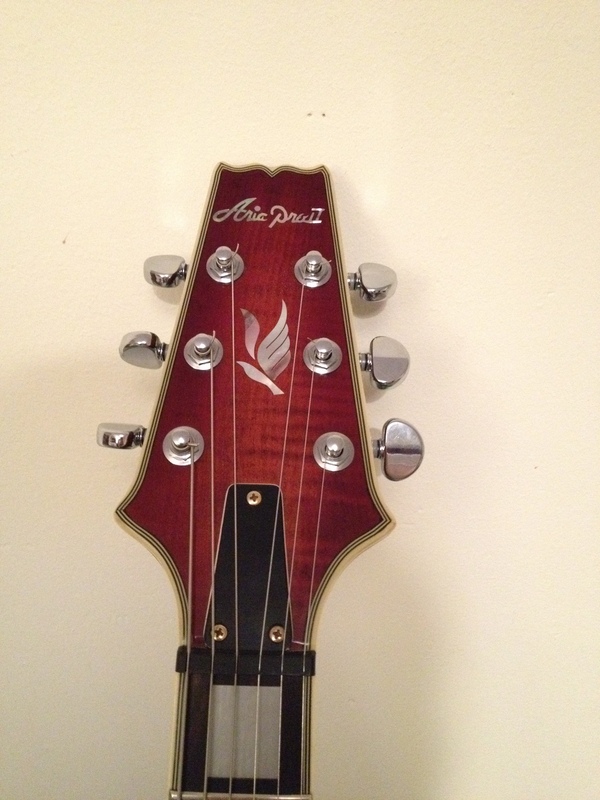 i think the issue points to the extreme break angle between the bridge and tailpiece coupled with non-roller saddles. i'm getting a few grinding sounds on the low E and A strings at the bridge as well. That looks ace George. Good work. Hope you get the trem issues sorted. what did you get for roller bridge? I have the wilkinson roller - it has high mass and is great and adjustable. Yeah, that bridge you are getting will fit the looks of your guitar much better than the wilkinson one. good choice. Here's another one that just popped up on eBay.